A few months ago, I discovered Petite Kitchen and a whole new world opened up before my eyes. A world where it became possible to eat incredibly tasty food that was gluten-free, sugar-free, dairy-free and more often than not egg-free too. Since then, I have eaten my way through a wide variety of Petite Kitchen recipes, and share with you here my thoughts on some favourite makes so far. As Eleanor is a fellow blogger and entrepreneurial young woman aiming to make more of her skills and talents, I respect this and so won't re-post any of her recipes - only the links to where you can find the original recipe over at her place. One of the other things I LOVE LOVE LOVE about her recipes as that they are all SO simple to make. Every recipe I've made so far calls for 'throw it all in the food processor together'. That's a match made in heaven for this busy mama who doesn't have time to slave in the kitchen for hours, but still wants to eat well! So for the next few weeks I'll share a few recipes each week with my own review of how they stacked up. I've made these little gems 3 times, and each time they've turned out slightly differently. But the last time was definitely the best as I added a little extra coconut oil not in the original recipe so they weren't quite as dry. Eleanor uses medjool dates as the base for a lot of her recipes and I just use dates from a packet, so I often add water to recipes where the dates are the basic ingredient (1/2 cup water for 1 cup of dates) and put them in the microwave for 2 minutes to let the dates soak up the water and soften before using in the recipe. You could wait for a few hours and soak the dates that way but I'm FAR too impatient! I also use Ceres Almond-Peanut Nutter Butter as the organic peanut butter in this recipe. The last time I made these they were the perfect combination of harder on the outside and lovely and soft in the middle - the sign of a perfect cookie in my opinion! Recipe at Petite Kitchen here. This one is hubby's favourite and I've made it twice now. He loves that it feels like he's eating a very naughty treat when it is in fact actually rather good for you. And the ingredients are so simple: ground almonds, dates, coconut oil, honey, ginger, eggs, and cocoa powder. I don't have anything else to say about this one other than yum! If you love lemon in cooking as much as me then you'll love these little melt-in-the-mouth sensations that are easy-peasy lemon-squeezy to make. The ingredients are ground almonds, coconut, coconut oil, honey and lemon. This is another favourite and I've made these twice now too. The first time I made the recipe I used almond meal (flour) and the second time I just ground up my own almonds to use and it still worked a treat. 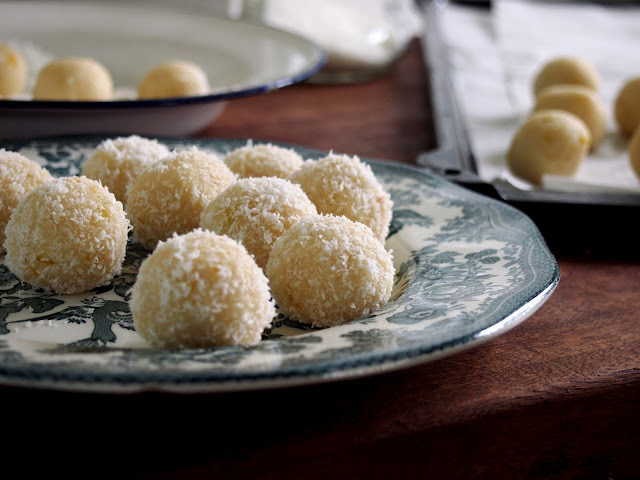 These are delightfully crunchy and the perfect combination of chocolate and coconut when they assault your tastebuds in the best possible way. Stay tuned for more favourite Petite Kitchen picks next week! This is fantastic. I'd heard about Petite Kitchen, but hadn't got around to looking it up. I'm super keen to try these recipes. Thanks for sharing! mmm I like the sound of easy and delicious cooking. I haven't really tried GF cooking before but I might give it a try! Shame though, the hubster can't stand dates at all and point blank refuses to eat anything with them in. I LOVE petite kitchen and her recipes are awesome! I have been baking (food processing) my way through lots of her recipes as well and have even added some of my own touches to them, which I love. Cool posts!